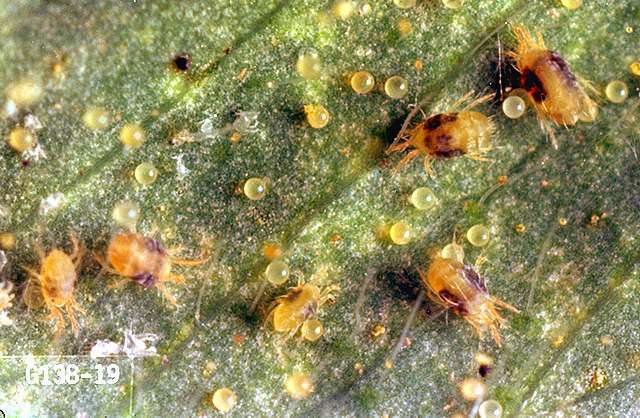 Application of nonselective pesticides, such as pyrethroids, and certain carbamates and organophosphates, which negatively impact mite predators and allow spider mites to increase. Proximity to certain crops such as corn, alfalfa, and mint, which tend to harbor mites. The first is the most important factor. In most cases, mite outbreaks in potatoes are an induced problem, brought on by management practices aimed at other pests. Biology and life history Spider mites overwinter in leaf litter and other debris on the soil surface. Twospotted spider mites have a very wide host range and in spring colonize many weeds, crops, and native plants. They thrive in hot weather and can build up large populations rapidly during summer. Scouting and thresholds Mite management requires early scouting. Initial mite infestations can be spotty within fields, making it important to sample for mites in several locations in each field. Because mites reproduce better on stressed plants, it is a good idea to check areas of fields that tend to be stressed for some reason (e.g., dry spots, low spots, and edges). It is also wise to check the edges of fields nearest to crops likely to harbor mites. Try to recognize mite populations before significant damage is noted and certainly before webbing occurs. There is no established treatment threshold for spider mites in potatoes, but it is well-known that treatments must be applied early in the infestation process to achieve control. Spider mites are known to be strongly affected by predatory mites in some cropping systems, especially perennials such as tree fruits. Many species of insects are also known to feed on spider mites, including predatory bugs, thrips, lacewings, and ladybird beetles. Miticides must be applied at low thresholds in order to achieve effective control. Once populations exceed five mites per leaf, control may be difficult. plant essential oils (e.g., cottonseed, clove, garlic, rosemary) have shown some efficacy against spider mites-Some formulations are OMRI-listed for organic use. Miticides must be applied at low thresholds to achieve effective control. Once populations exceed five mites per leaf, control with miticides may be difficult.